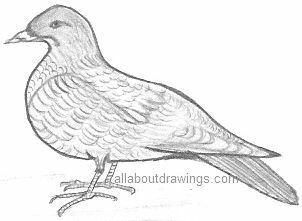 If you want to produce some dove drawings, you can be assured that it's not as hard as it looks. When you search for a picture to copy, make sure the background isn't crowded because you really need the bird's outline to be quite distinct. If you can't find a good reference photo, try copying this simple outline for starters. I like to study and copy straight from a reference picture so I started with the beak and made sure I had the correct shape of the head before progressing further. There are no set rules for copying - so long as you are comfortable, that is all that matters. I had a few falsh starts, but once I was satisfied with the shape, I completed the drawing in no time. Don't let failure beat you because when we were learning to walk, we fell down a lot but we got up and kept trying again. It's a natural process so keep that in mind when you're learning to draw. Everyone has setbacks but it's how you handle them that counts. 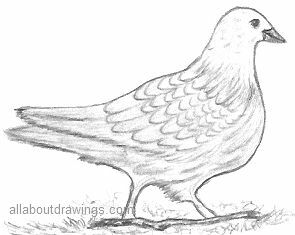 Doves belong to the Pigeon family and most live in flocks. The bigger birds are called pigeons and smaller ones are known as doves. They have a plump body, a small head and short legs but they still fly very fast. The male is slightly bigger than a female. The feathers are black, blue, brown or gray and they cover all of the body except for the eyes, beak, legs and feet. They build their nests with loose twigs and grass. They're not fussy about where they nest because they can be found in trees, bushes or on the ground. Doves lay 2 white eggs and they hatch after about two weeks. The young are born blind and featherless. If they survive the first couple of months, they can live for three to five years. They eat fruit, grain and nuts. Their enemies include hawks, owls, cats and rats. The Mourning Dove is found in America and it is gray and brown with a splash of pink on it's breast - it makes a sad cooing sound. 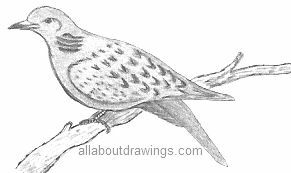 This is a drawing of a turtledove which is found in Europe. It is very similar to the Mourning Dove, including the sound it makes. A turtledove has pretty colors - mainly light gray with orange on his wings, a smudge of pink on the breast and highlights of black on the tips of the feathers on the wing. Well, I don't know about you, but when I think of doves I visualize them to be white. I suppose that's because we see white doves released for special occasions and it's also the symbol of peace. I like experimenting each time I draw, so, in this drawing on the right, I tried to smudge the depth of feathers around the neck with an ordinary tissue. I haven't perfected it yet but practice makes perfect! 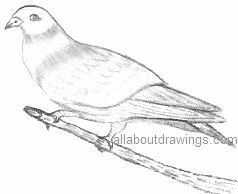 I found dove drawings quite easy and a pleasure to do. I encourage you to pick up your pencil and just do the outline that can be found at the top. This action proves that any drawing is achievable once you set your mind to the task. We don't have to possess any "special" talent, all you need is a bit of persistance. 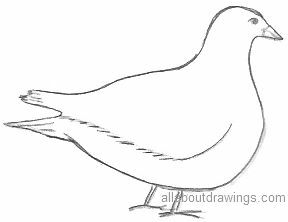 This last dove drawing took me five, maybe ten minutes to produce. At this stage, I had been involved with drawing for about one year. Remember that I am neither a professional nor established artist but I am on a mission teaching myself to draw and enjoying every moment. My wish is for you to have the same experience.